Paris is an international city and its museums reflect this. 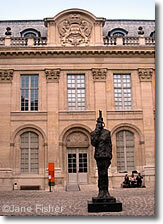 For centuries Paris has been an international center of culture, and today many museums reflect this internationalism. The Musée de l'Homme, in the Palais de Chaillot, is closed for renovations until 2015. Traditionally focused on anthropology and ethnography, much of its collection was transferred to the Quai Branly Museum in 2006. A branch of the National Museum of Natural History, the Musée de l'Homme is redefining it focus and will contribute to our understanding of prehistory and physical anthropology. Naturally, many of the other museums of Paris feature international art and artists, but the ones highlighted above may be of particular interest if you're wanting to explore international cultures. 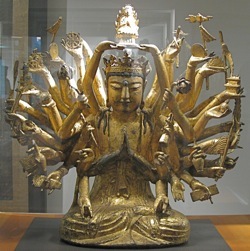 Above, Thousand-armed Avalokitesvara, Korea, 10-11th centuries, Musée Guimet. 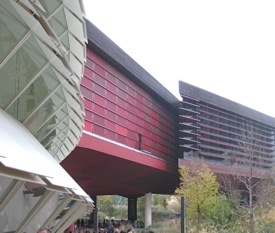 Below, Unusual architecture of the Quai Branly Museum.